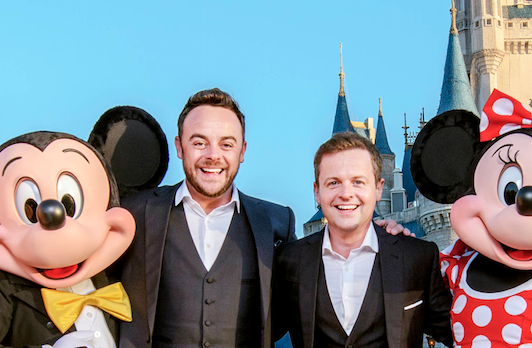 Ant and Dec have teased details about Saturday Night Takeaway‘s biggest giveaway yet – a trip to Walt Disney World Resort in Florida. The lucky winners will board a specially chartered Virgin Atlantic plane to Florida, where they’ll get accommodation, tickets to all six Disney parks and a $2500 Disney gift card to spend. They’ll also be special guests on the Saturday Night Takeaway series finale, which will broadcast live from the world’s most magical holiday destination. Talking about the decision to visit Walt Disney World for the finale, Dec said: “Last series, we took the final show overseas for the first time ever and broadcast live from Barcelona. So for this series we thought – what next? Speaking about what to expect from the special finale episode, Dec promised plenty of surprises and some big musical numbers. Ant & Dec’s Saturday Night Takeaway comes live from Walt Disney World Resort in Florida with Virgin Holidays on Saturday 8th April at 7pm on ITV.